Lock in a great price for Dar Echchaouen – rated 8.8 by recent guests! Beautiful views from our room but we had to take 112 stone steps to get there. They are not uniform and if you have knee problems this could be difficult. Very beautiful garden, especially at night together with all the delicate lamps. In the evening we relaxed by the pool, in summer it’s pretty cool at night. We ordered drinks and had it in the sofa by the pool, what a dream life! Didn’t want to leave next morning.... The staff helped us with luggages when we checked out (in the beautiful garden there are lots of stairs) and ordered taxi for us. The rooms were clean and spacious, newly renovated bathrooms! Air conditioning was great too! The pool area was magical, and we spent most of our time here! We tried out the restaurant and were blown away, exceptional service, delicious view and great ambience. Most staff spoke English and I recommend the Beef/prune tagine and the Chicken pastille. The staff went out of their way to make us feel welcome, even sang happy birthday to my daughter with candles. This is a slice of heaven in Morocco! The view was great and the property was private and quiet. We went for a great walk through the medina and found it easy to find from the hotel. Great wifi too. I've stayed at many hotels in Morocco and the staff here were by far 5 star. Messien! Brilliant location and outlook. Staff were very helpful. Easily the best hotel in Chef. Excellent staff that spoke English well. Great view of the town for high up in the hill. Beautiful grounds and clean. The grounds were very nice and the view from the upper bungalows is spectacular. If you traveling by car, make sure you stay on the main yellow roads on the map. Don't follow your GPS which will take you through the small villages in town! We learned that after we checked in, the hotel itself was absolutely beautiful with stunning views of the blue city all around, the food was excellent at the hotel restaurant. We fully enjoyed our stay, staff was very friendly and helpful! Hotel has lots of stairs but staff is able to help you with your luggage which was a major plus! Very cozie and quant. Authentic Moroccan atmosphere with modern amenities. Riad Dar Echchaouen is near Chefchaouen’s Medina and the Ras el Ma Airfield. It offers en suite accommodations, free on-site parking and free Wi-Fi. 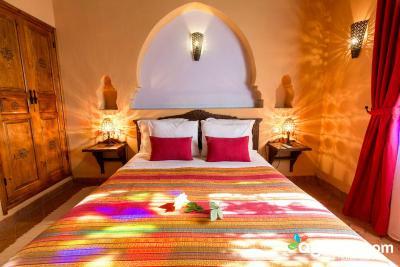 Rooms at Dar Echchaouen are air-conditioned and decorated in traditional Moroccan style. Each room and suite has a private bathroom featuring a shower with tadelakt tiles. The suites have a sitting area and fireplace. Dar Echchaouen serves Moroccan dishes including couscous, tagine and pastille. Guests are invited to relax in the riad’s garden or enjoy the swimming pool. 뀐 Located in the top-rated area in Chefchaouen, this property has an excellent location score of 9.3! When would you like to stay at Dar Echchaouen? 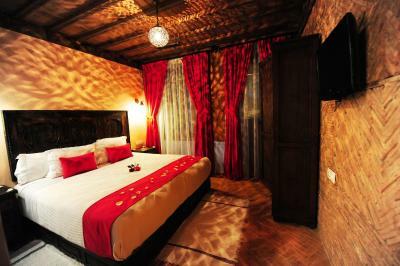 The rooms are air-conditioned and feature an private bathroom with tadelakt tiles. Extras in the suite include a living room with a fireplace and the possibility to add a baby cot or extra bed. House Rules Dar Echchaouen takes special requests – add in the next step! All children from 7 to 11 year are charged EUR 10 per person per night for extra beds. Dar Echchaouen accepts these cards and reserves the right to temporarily hold an amount prior to arrival. 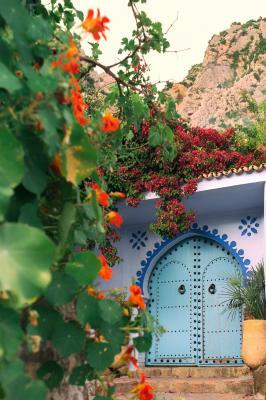 The property is in great location overseeing Chefchaouen. However, they have poor facilities. WiFi isn’t working in our suite, and the pool would have been great if it wasn’t dirty filled with bugs and spiders. the staff are not really accommodating and friendly. Not a dislike but if you have elderly people in your group just note that some of the rooms are accessible only by lots of stairs. Ask for a closer room if access is an issue. If you have access problems like wheelchairs then it’s impossible Also service at breakfast super slow. You need to ask for things - nobody told us what there was. We saw other people having eggs so had to ask. Beautiful property at a great location. Comfortable room and clean bathroom. The hotel was fantastic and boutique like building. It provides spectacular panoramic view of the city. Staff were very nice and professional. Staff should be more friendly. But still helped us. Loved the Dar, had the perfect view of Chefchaouen , My look was really romantic, breakfast was amazing, I think this is the best place to stay in Chefchaouen. Air condition was directly over the bed as in many hotels here. Free parking is announced but park boy wants money anyway. Bath was not very nice. The staff is nice. It is in a good location. You have a good view of the city. The rooms are the usual standard. Direction of shower is a little weird, we had to hold it by hand all the time. Lots of wasps around food but that cannot be helped! I prefer smaller properties. Size of pool, view, location. If you are not familiar with parking in these narrow streets rather park a block away and walk to the hotel- ask for a porter to help with your bags. We brought a kettle for our room to enjoy coffee first thing in the morning. The staff were on their phones all the time . The room we were given was like a dark cave - not at all welcoming. The 2nd day we were given a much nicer room after much complaining. The pool was full of screaming children who belonged to the staff so difficult to relax.